Washing your windows consumes a lot of time and exhausts you? You can change this now – just contact our customer care operatives and request our window cleaning in Hornsey Lane. We will handle this chore for you and the final result will be ideal for every part of your windows – glass surfaces, frames and ledges. With our support, you will have the flexibility to do whatever you desire with the time you normally spend for window washing. But our services will give you even more, as you can see from our list of advantages. We also provide our professional services in nearby areas: Dartmouth Park, Highgate, Kenwood House, Belsize Park, Upper Holloway. We promise that the windows of your business premise will be nice and spot-free, like newly-purchased. Accomplish that by just requesting our commercial window cleaning. For windows as high as the fourth floor, we use water fed extension pole system which is completely safe and effective. London is famous for it's tall buildings. So when it comes to those high-rised windows we will bring into action our rope access squad. With this sophisticated way of cleaning, we can give you results like no other! We use advanced techniques of window cleaning to guarantee you will have excellent end results. With our water fed pole system, jet washing and rope access equipment, you can be sure that your property's windows will be crystal clear. Furthermore, your home is in good hands – the cleaners are fully insured and thoroughly trained. The water fed extension poles are connected to water supply tanks, while our rope access pledges for safety – even when we clean tall buildings. You can get advantage from these methods today – dial 020 3746 3113! You can depend on the abilities and experience of the professionals for cleaning all types of windows. The glass surfaces in our competence are: single or double windows, sash ones and bay windows. Of course, if you have garden windows, French doors, greenhouse or skylights, we will make them spotless, too. With our progressive ways of working and latest equipment, we can deal with all kinds of window cleaning, even with difficult to reach glass panes. 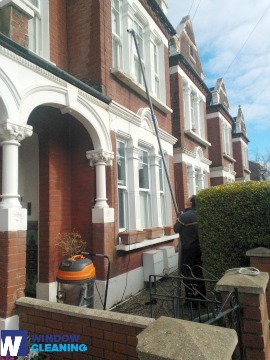 With our speedy and excellent domestic window cleaning in Hornsey Lane, you will improve the look of your home immediately. We utilise purified water for inside/outside cleaning of your windows. We make this possible by standing on the ground with the help of water-fed extension pole system, which is safe both for your property and the cleaners. Discover more – contact us on 020 3746 3113 or complete our online booking form. You can also use our chat alternative. Our assistants are on hand 24/7 – you will receive answers to your questions. You can be one of our happy customers today!